Today's keyboard awesomeness - Switch tabs by name · Nifty tidbits! Use a vertical tab bar on the side: This works on big screens where you have enough real-estate but it’s a pain when I’m at home using the laptop’s 14in screen. Where this fails is that you can only switch between tabs in the same window - so if your two tabs are in different windows, you are out of luck. What I wanted is something like CtrlP for vim (or quick switch in VS Code or Sublime etc) that will show a list of tabs titles that you can type in by name. 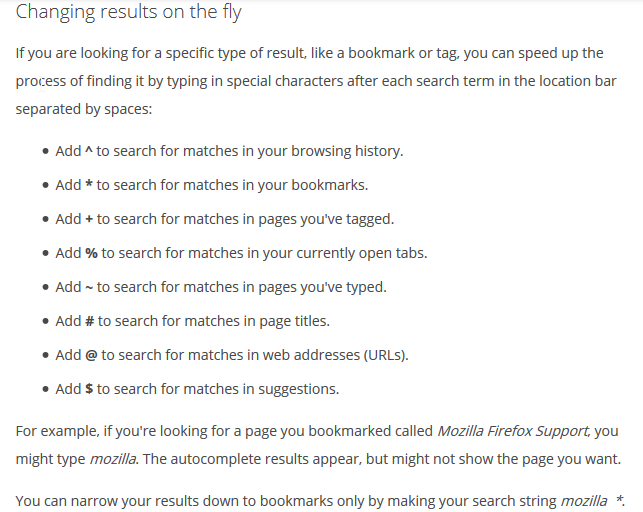 Now, firefox’s location bar will let you switch to matching tab when you type in it - but it’s mixed with a bunch of other entries from history, bookmarks and search suggestions. I was looking for an extension but landed on Awesome bar page and at the bottom you have this small nugget - Turns out that you can filter the results shown in the awesome bar with different characters. Figure 3. Didn’t know about this till yesterday! And voila! - switching tabs is super easy - type in a few chars, a space and % and you get a list of matching tabs across all open windows. Figure 4. Nirvana? almost there! Now this still has a few niggles - I’d like to be presented with just a list of tabs - something like focusing on the awesomebar and then hitting %. That’s not how it is since you can enter multiple words with different search meta characters and the filtering works. Nice - but not what I want. The second gripe I have with this is that if you want to bail (or you don’t find a matching tab), then Escape works but keyboard focus remains on the awesome bar and not on back to the page. I find that I have to click on the page which I find a little irritating. Figure 5. This is really tab switching Nirvana! Vimium on FF isn’t as polished yet - and there’s still a few quirks that trip me up - but this gets me 90% of the way and a definite improvement. If you’re not on Firefox 57 yet (or generally not a FF user), then I’d recommend giving it a shot. FF’s good for the web :) and you have better privacy. with FF57 (Firefox nightly), FF has gotten a serious speed upgrade in almost all departments. Also, it’s been super stable - and you’d be helping Mozilla out with telemetry data!